← Squash makes the final three for 2020! The ball comes off the front wall hard and deep toward the back left corner. I lunge for it, but my brain tells me there’s no way I’ll get it, so I don’t. The ball dies in the back. “You could’ve gotten that!” the guy scolds. He shakes his racquet at me. Ten minutes ago, I was rolling my eyes at that kind of comment. Yeah, right. But now, a few drills into my lesson, I’m seeing that it’s not only possible, it’s probable . . . if I do what he tells me. Keep my racquet ready. Wait to take my last step toward the ball when I know where I’ll want to hit it. Don’t get too close. Keep my wrist cocked, and my palm facing down. Try not to scissor my arms and end up looking like an opera singer. Oh, and let my racquet follow the ball, but not my eyes. And it seems like two million other things. The thing is, applying a few of these things does work. After a dozen or more of these annoyingly accurate back corner balls, I begin to get my racquet on them. I immediately think of my regular opponents. Ha. I like this guy. This guy is CityView’s brand new squash director, Charlie Johnson. And if that name sounds familiar and you have never played squash in Dayton or Cincinnati, Ohio where he was a pro and tournament director, then you may have ordered a squash ball, racquet, or handle grip or two from his internet shop www.cjsquash.com. I have, and I’m pretty sure my dad did in his tennis playing days. In an earlier incarnation it was one of the first mail order racquet sports shops to rival Holabird’s. 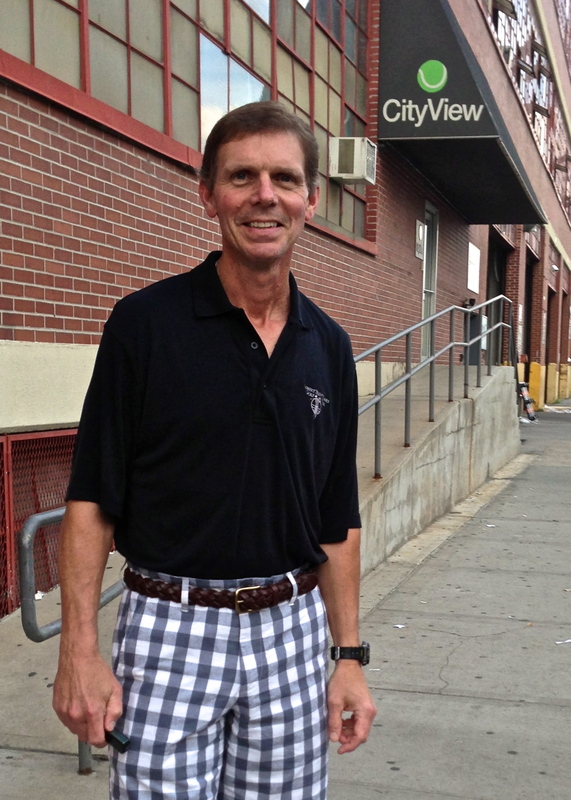 I joined the CityView Racquet Club in Long Island City in 2011 in no small part because of its then-new squash pro, John Musto. John had coached our New York Howe Cup team in 2010 and his kid-like enthusiasm as well as extremely clear way of explaining squash technique was a revelation to me. Having picked up the game at my local YMCA and for many years too poor to pursue lessons, I had learned a lot of bad habits—too numerous to count!—and John was the first pro who showed me how to break them. But all good things must end…or are snapped up by others, and John went off last year to a plum position at the Princeton Club back in Manhattan. 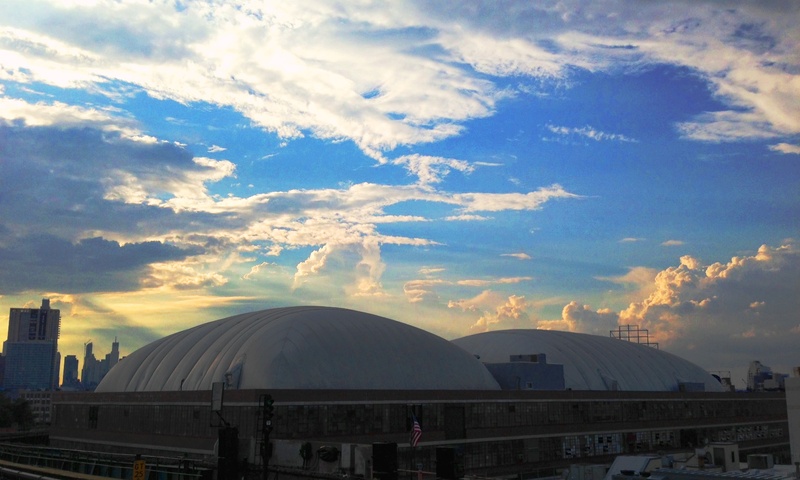 Now CityView is well known for tennis; its marshmallow white tennis bubbles are crown jewels on Queens Boulevard. The royal family of racquet stringing runs the pro shop. And with its valet parking, lounge-worthy locker rooms, and fully stocked bar, it has a country-club feel albeit with a city view. I’m pretty sure that CityView’s founding fathers will admit that squash was a bit of an afterthought. But to their credit, they didn’t skimp when they decided to add it in. The state of the art courts, with glass back wall views of a stunning Manhattan skyline (a friend regularly runs out between games to take pictures of sunsets), are now fairly full of displaced players from my dearly departed Printing House club in the West Village, New York Sports Club’s incredible shrinking courts, as well as recruits who realized that the commute from midtown Manhattan was about the time it took to get a morning coffee at Starbucks. Plus, players beget more players. When I joined two plus years ago, there wasn’t a women’s league team. Now there are two, and quite possibly three next season. Every men’s division team is full to overflowing, as well as A, B, co-ed, and women’s doubles divisions. Who needs a pro now? Actually, this is exactly when CityView can use a good pro—when players are looking to improve, move up a notch or two on their league team ladder, gain a few points on the US Squash rating system. CityView has had some great part-time pros—I will forever be indebted to Graham Basset for showing me the corner slice on the doubles court—but to keep a squash membership motivated on its many levels, it helps to have a pro who’s there day in and day out, and not just giving lessons, but getting to know the needs of the membership community. Not everyone can afford regular lessons, but they might spring for clinics where the pro gets on court and shares a few tips, or they might want to try out doubles or do some short term training leading up to a tournament. Now who knows if CityView had all these things in mind while doing their search for a squash director, but the fact that Mr. Johnson is well versed in all of them from his tenure in Ohio is a huge plus for CityView squash players. 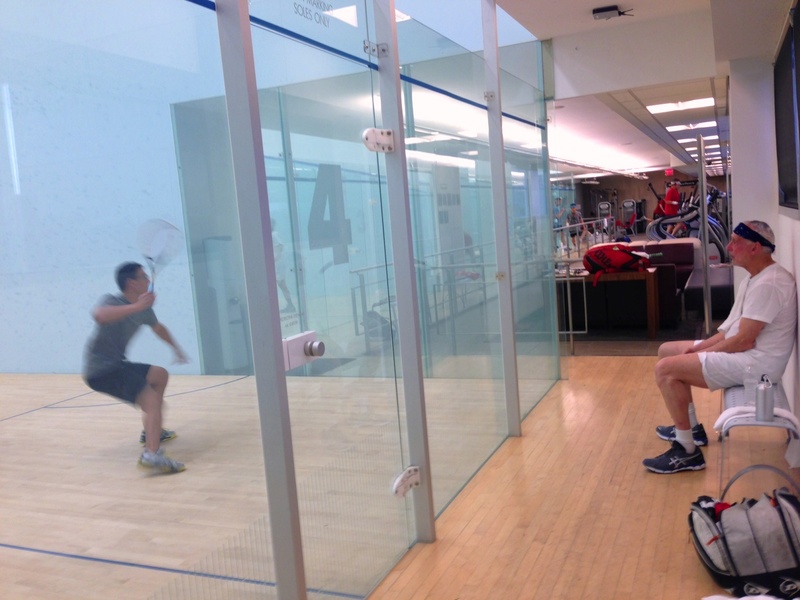 After taking my first lesson with him recently, I asked him if to fill me in a bit on his life leading up to his move to Long Island City; it’s not every day that you meet a squash pro with an Alabama accent, so I was intrigued. Turns out that New York City is not totally new to him. Before he pursued a career in squash, he pursued a life in music as trumpet player, and after receiving a degree from the Cincinnati Conservatory of Music attended Juilliard for a year. Coincidentally, that was also when he discovered squash. An avid tennis player, he and some friends discovered the squash courts of a nearby university and tried out the game when no one was looking. The game stuck, and when a job with the Cincinnati Symphony didn’t pan out, he packed up the trumpet and took out the racquet—actually, many racquets. Back in Cincinnati, he helped start a mail order tennis shop, and by the mid-90s, Charlie Johnson Tennis and Squash was in business. At the same, he was also playing squash at the Cincinnati Racquet Club, and when some of the first international softball courts were built in 1989 at the Sports Mall in Cincinnati, Charlie was a quick convert. He worked with English coach David Pearson, and then became a protégé of Don Mills, the legendary pro at the Cincinnati Country Club, learning the coaching ropes, helping to run tournaments, and giving lessons, until he took over as head professional when Don retired. Three years later, he was asked to be the director of the newly opened Dayton Squash Center—a five court club built and funded by a local patron of squash. And that’s where he undoubtedly gained much of the experience that CityViewers are about to benefit from. Coaching, clinics, tournaments, juniors, field trips, ladders, ice-cream sundae squash socials….and don’t knock that last one until you’ve tried it. NYC may be the culinary capital of the U.S., but Ohio knows its ice-cream. 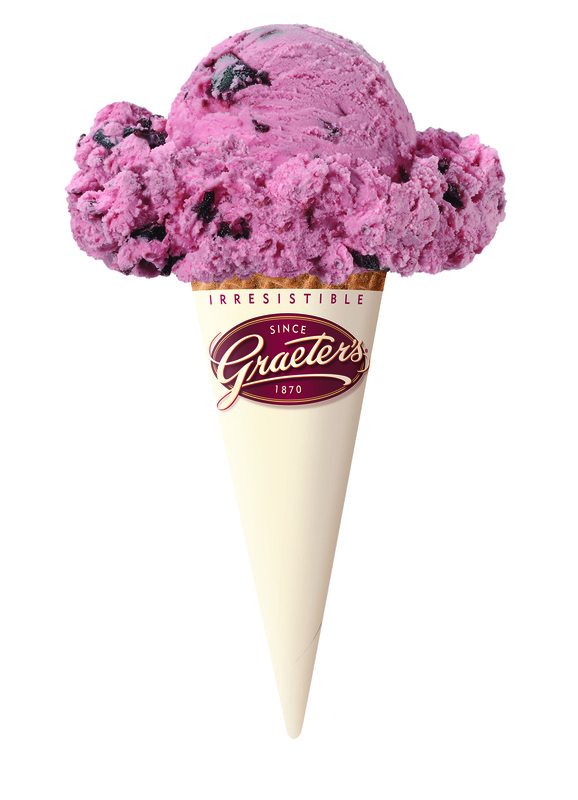 Graeter’s ‘french pot method’ ice-cream has inspired many a squash player to go the distance. Then again, not usually this far. . . . So how do you get a wife and four daughters to leave The Heartland for The Big Apple, I wondered. Slowly but surely, it sounds like. Eldest daughter Corri is already spending part of the summer here, before heading back to her sophomore year at Amherst College. Another daughter, Sarah who plays the junior tournament circuit, will be joining him in NYC in the fall. And his wife Susan and their two youngest daughters, Elizabeth and Ella, will let Charlie find his feet on the courts and city streets before they move out here next year. Certainly, it’ll be a big change of pace for all of them, but like the song says: if you play squash here, you can play it anywhere….or something like that. It may also help that an icy taste of home can now be found at Fairway, although Charlie admits to a nightly bowl of more local brands. During the daytime through evening hours, he’ll be working those calories off at CityView, as his coaching is already underway. Just don’t expect his mid-western easy-going nature to take it easy on you in a lesson. I came off the court wringing out my second sweatband of the evening and spent my entire subway ride home jotting down every tip I could remember. I’m happy to say that a few have already taken hold – just ask one of my regular opponents. But after running from corner to corner, he’s probably too tired to tell you. And I’m pretty busy myself doing some research on Graeter’s flavors. Maybe the secret to great squash is . . . great ice-cream? 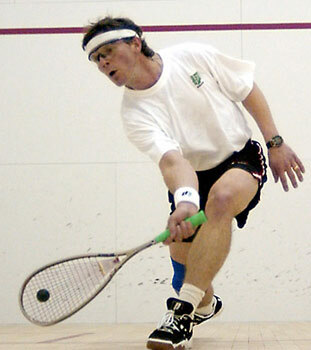 To order squash gear, visit www.cjsquash.com. 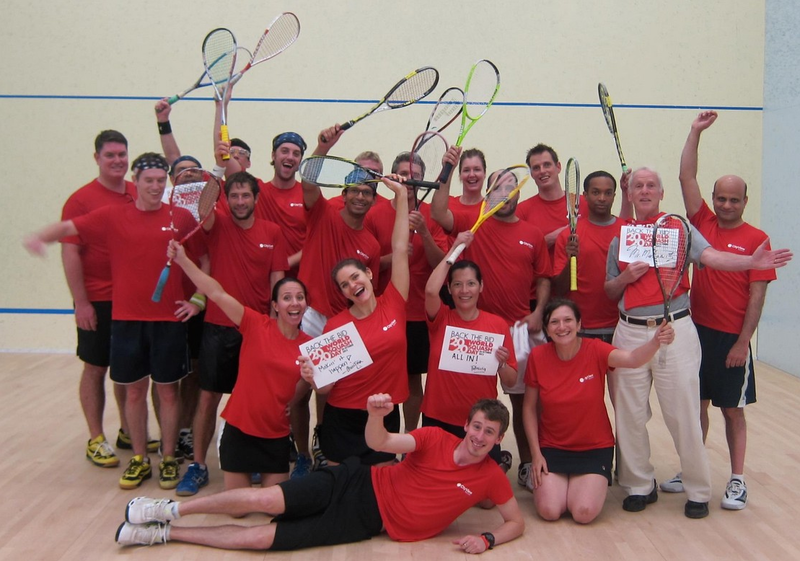 New York Squash members receive 10% discount (see NYSquash’s recent email for discount code). Nice article. So that was why you in the back of the Dubs court taking pictures. I thought you were trying to get some eye candy of Stephan. Looking forward to ice cream on the deck. What a fine essay, Tracy; I’m looking forward to meeting Charlie some time, as well as yourself. AND a visit to Fairway! Thanks, Aubrey, I think we should make that happen! I’m delighted to see Charlie already reaching deep into the lives of the members of CityView! His imprint in Ohio is deep and will never be forgotten. I wish all of his new friends and the entire squash community great success…but watch out if you cross our paths at a tournament, we’ve had years of training and we’re heading for the east coast tournament hospitality. You are welcome to visit us at the Dayton Squash Center if your travels bring you to the Midwest…just call me 937-321-4823. Play hard, have fun and…eat ice cream! Well done Tracy…He brings…. shall we say inspiration as well as perspiration to the court!